Cancer Crossing: CHEMO SAVVY DRAGON BOAT TEAM - WHO ARE THEY? October is breast cancer awareness month and in case you have ever wondered 'who are those fundraising dragon boat rowers? 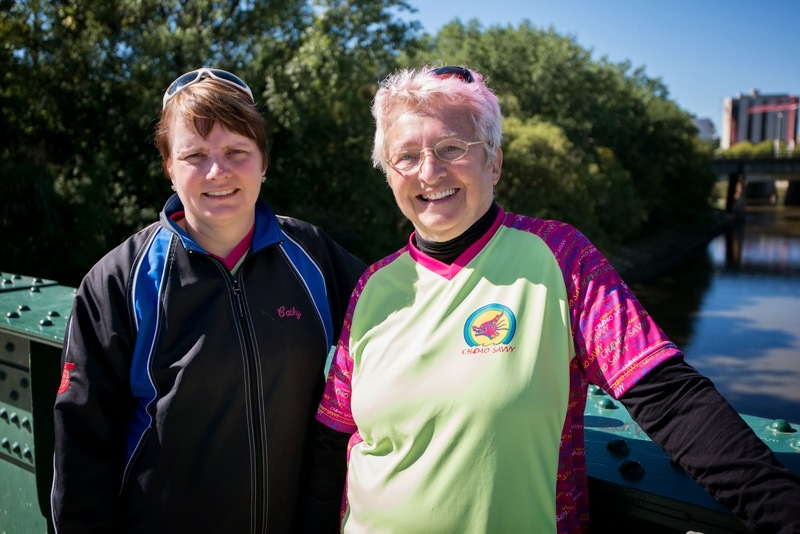 ', we would like to introduce you to Cathy Prusak (left) and Shirley Stone (right), both members of the Chemo Savvy Breast Cancer Dragon Boat team. The sport of Dragon Boating is a sport unto itself but additionally, the element of breast cancer support through Dragon Boating is a world wide movement. Teams like Chemo Savvy are part of a global sisterhood of breast cancer Dragon Boat teams. Cathy explains, "Shirley and I could get on a plane today, fly to Italy, call up people we don't know in Florence or Rome, or go to Ireland - you name a country across the world - and we'll say 'Hi, we are Shirley and Cathy from team Chemo Savvy, can we come and paddle with you today and it would be yes, and you would just be part of that team'. It's a Global sisterhood. Cathy explains further, "I was diagnosed 17 years ago. I was working, focused on career. I was a young woman and I was active, but the cancer diagnosis kind of cut me off at the knees and I was very very fearful that I wouldn't see my fortieth birthday - that was sort of a target I had in my mind. So I changed a lot of things. Especially the year that I was on Chemotherapy, it was all about me, and I really took the time to heal and make time for my friends and family, that was most important to me. Maybe I had an unrealistic vision about my future and that I wouldn't have one, so I was especially fearful of death and I really took that to heart and made changes. At the time I was diagnosed, this Dragon Boat team didn't exist and so I was in a young woman's support group that was literally a lifeline and I recognised very early what kind of support I needed, and I needed to be around other people that were walking that same path I was. People who knew what I was going through without me having to explain it or justify it. We could tell our deepest fears openly, without fear of hurting anyone else. You know, things you couldn't say to your family, you could say to this group of women, and so very early on I realized how important that network of support was to me and my survival, and I think that has changed my life immensely. It has taken me on a very different path in terms of how much I value the idea of support groups. This group is a personal mission to make sure that any woman who is out there alone and fearful, is found by us, and we make sure she gets the warm hug of this group so that she could also express those fears in a way that is therapeutic and can help her move on to 17 years of survivor". Shirley agrees that the Chemo Savvy Dragon Boat team was a huge influence in her breast cancer journey. "I went in to the breast centre across from St. Boniface Hospital for my first test to confirm I had breast cancer. On the table was a picture book, a photo album of the Chemo Savvy breast cancer team and I was thinking I am going to die before I really....I was a workaholic, I never took a lot of time for myself, I had a long list of things to do before I die. Now I am facing death and I am thinking I've got to do something, I can't die now, and so there was this book of the Chemo Savvy team and I looked through it and I thought all these women were probably super athletes, this is how they looked to me, and I thought regardless, if I make it through this I am joining that team and so I did. I quit smoking, I started to eat better and I have always said to myself when I retire I am going to do all kinds of sports. I had a daughter and then I quit doing all the sports I had been involved in. I curled, I bowled, I rode a bike. I quit doing those things. I was just work work work and then I said to myself no, I am going to get into all those sports again because I have to be fit in order to paddle. I joined curling, bowling, Aquasizes, I belong to two walking clubs plus Chemo Savvy three days a week and you know what, they all give me life". Shirley's advice to a newly diagnosed cancer patient would be "There is a lot of life ahead of you. I'm sure you are afraid of dying and you probably have a long list of things you wanted to do before you die, and you are not ready for death, so lets just talk about that list of things you 'd like to do in your life and focus on it, and move toward it". from your friends at Cancer Crossing.